Linden Lab will announce today that their second “work offering”, Second Life Enterprise, is entering an open beta period, prior to release. The preliminary beta for the Second Life Enterprise has been running since April this year; the open beta program will run through Q4 this year, and general availability will be announced during the first half of 2010. The associated service, the Second Life Work Marketplace, which is currently in development, will go into closed alpha at the end of Q1 2010. 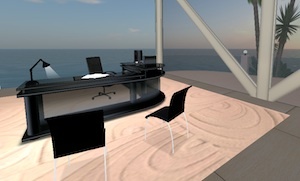 The Second Life Enterprise bundle is priced from US$55,000, and this price will cover both hardware and software sides of the solution; two servers will be provided, one for spatial voice (VOIP) and one for virtual environment simulation of up to 8 regions, supporting a maximum of 800 users (though 800 users with spatialised voice seems like a recipe for chaos). There is no indication yet as to whether the Second Life Enterprise product will replace Immersive Workspaces, the Lab’s first and, to our knowledge, only other, “work offering”, or whether the two will exist in parallel. Organisations already participating in the beta program include IBM, Northrop Grumman, Naval Undersea Warfare Centre, DefenseWeb Technologies, Case Western Reserve University, and The New Media Consortium. Intriguingly, Linden Lab has announced that “content owned by the company can be moved from the main Second Life environment into the Second Life Enterprise Beta environment”. This, of course, raises many questions. Technically, by the Second Life Terms Of Service, Linden Lab has the right to distribute other people’s content for any purpose related to the operation of the service without explicit permission from creators. Will any and/or all content on a simulator owned by a company be able to be sucked up and spat out again in the Enterprise environment belonging to that company? How will content ownership be determined? What will happen with third party content, given these circumstances – especially given that a lot of enterprise presences on the main Second Life grid are composed of a reasonable percentage of third-party content already, under wildly different permissions. These issues aside, though, Second Life Enterprise looks to be a solid business product, particularly for virtual meetings, prototyping and data visualization – three areas where Second Life technology does well. which service? and what service when the tos was agreed to? all of which will find another court case filed, if how you put it, LL just wraps up others IP for resale to a third party in another product that is not the SL grid as identified at the time of the IPs expression / creation in that services grid. the new market is the funnel, how that new marketplace is developed and executed will certianly be under close watch by IP owners allready in the advertised original sl main grid. i see virtual search warrants being served weekly quite soon…. or the new copyright global initiative will fix the flawed safe harbor and DMCA take down distasterous laws. Linden Lab owns the assets, and continues to do so as long as they remain as SL assets.